A village in Shropshire would become the exact centre of the UK if Scotland became independent, Ordnance Survey (OS) has calculated. Scottish independence is the subject of a referendum on Thursday. OS said the centre of Great Britain had been "hotly disputed" for decades, but for the first time it had calculated the results for the UK as a whole. It said a field near High Ercall would become the centre if Scotland became independent. 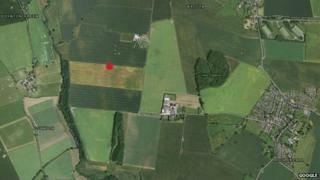 The field south of Shawbury is at grid reference 357767 317879. With Scotland included the centre point calculated by OS is in the middle of Morecambe Bay, at map coordinates 341575 466760. The term Great Britain currently refers to England, Scotland, Wales and their collective islands, while the UK also includes Northern Ireland. "We don't map Northern Ireland, but we got the data and applied it," said Rob Andrews from Ordnance Survey. He said: "We use the gravitational method of working it out. If you imagine cutting out the whole of the UK with a giant pair of scissors and balancing it on a church spire, it's the balancing point. "There are other methods, though, which can deliver different results." Meriden, near Coventry, and Fenny Drayton in Leicestershire both claim to be the geographical centre of England, while Haltwhistle, in Northumberland, and Dunsop Bridge in Lancashire have strong claims to be the centre of Britain depending on which method is used.